Ever wonder what it must be like in Wonderland? 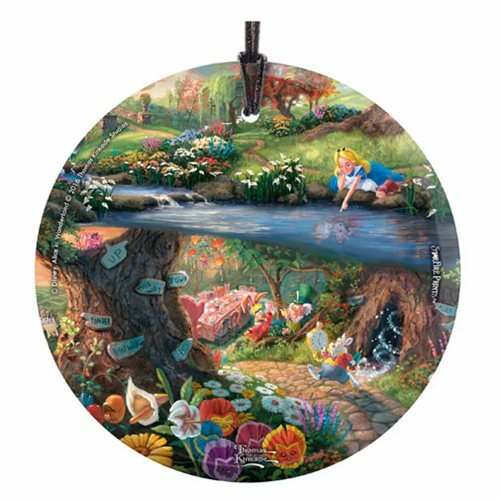 Now you can hang this Alice in Wonderland Thomas Kinkade StarFire Prints Hanging Glass Ornament near a window or on a tree and watch as the lights bring this stunning piece of movie history to life. The ornament features a colorful design showing Alice overlooking Wonderland. Comes with display ribbon and measures 3 1/2-inches in diameter. StarFire Prints hanging glass prints are translucent yet vibrant with color. Designed to capture the natural light making every image a true piece of art. Ages 13 and up.